Don’t Leave For The Beach Without These Essentials! Get all your summer staples at the SM Mall of Asia Big Big Summer Sale! It's summertime, and we know you're itching to feel the sand on your toes and the sun on your face. Whether you're heading to Coron for a relaxing time or to Boracay for nights of partying, make sure you have all these essentials with you! If you could only bring one thing to the beach, make it a cute swimsuit! A bikini is probably your go-to style, but you may want to try one-piece suits or maillots (which are ~*huge*~ right now). Tip: Check out Freeway for cute, retro-inspired swimwear! You have to cover up at one point during your beach trip, but that doesn’t mean you need to look frumpy! Forever 21’s summer collection has everything you would want to wear this season, from the trendy lace-up blouse to classic denim shorts. Any beach trip wouldn’t be complete without a pair of fierce sunglasses. With a wide variety of styles to choose from, Sunnies Studios has frames for whatever look you're going for. Tip: Make sure to choose a pair that suits your face shape! There's no way you're taking your leather pumps to the beach, right? All Flip Flops, an exclusive reseller of Havaianas, sells flip-flops in different styles, colors, and prints. A fair warning: You may end up buying more than one pair! This bag type is ideal for beach trips because of how spacious and lightweight it is. There's definitely room for all your essentials—minus the added weight of metal fittings. Head to Forever 21 for summer bags in all shapes and sizes. You need to take care of your skin no matter where you are—especially if you plan to spend countless hours under the sun! Aside from sunblock, don't forget to bring facial wash—the body soap from the hotel would be too harsh for your face! Take a mini bottle of moisturizer and some sheet masks with you, too, for an extra layer of care. Shorten your travel time by taking some snacks with you! Buy a box of J.CO Donuts for the road—you’ll avoid the need to do a stopover. Floaters just aren’t for kids anymore! These super cute inflatables from Toy Kingdom will not only keep you afloat, but will also serve as props for all your #beachlyf photos! Good news, CGs! 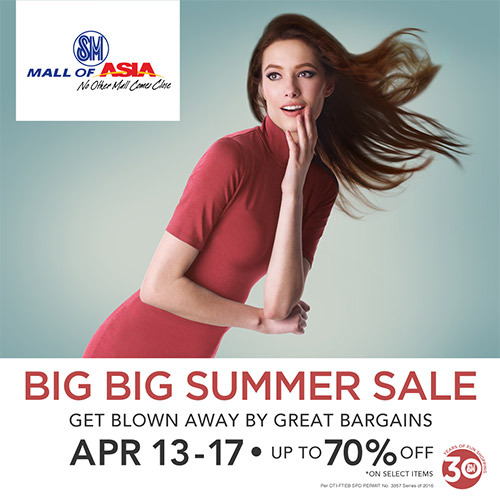 You can grab all your beach essentials for cheap at the SM Mall of Asia's Big Big Summer Sale this coming April 13-17. With discounts of up to 70% off, you can get everything you need for your trip to the beach without breaking the bank!